The unnamed Nat was complaining about his manager’s passive approach to clubhouse problems, but “put his head under the pillow and hope it goes away” is also an accurate description of Williams’s approach to in-game tactics. In almost every aspect of game management, Williams is less active than the norm. Pinch hitters? Not counting replacements for pitchers, Williams has pinch hit only 26 times this season, third-fewest in the majors. Hit-and-run plays? The Nats have put on only six, fewer than any other team. Pitchouts? Williams has called for one all season. Lineups? Despite the constant comings and goings from the disabled list, the Nats have used only 85 different configurations (pitchers excluded), tied for fifth-fewest in the majors. Challenges? The Nats have formally questioned only 29 calls, two more than the least-contentious team. Relievers? No other NL manager has used as few as Williams’s 459. Defensive shifts? Only the Braves have employed fewer than Washington’s 215 (up infinitesimally from 2014’s last-place total of 201), even though Williams poached defensive coordinator and advance coach Mark Weidemaier from the Diamondbacks to help him with positioning, and even though Williams was hired in part because his “willingness to adopt defensive shifts” impressed GM Mike Rizzo. Some of these observations are more descriptive than prescriptive. Pitchouts, for instance, are probably pointless. Lineup shuffling is either irrelevant or a matter of team taste, with some groups valuing stability and others deriving value from “shaking things up.” And even if Williams weren’t a bad bullpen manager, one wouldn’t expect to see him call for relievers that often, since the Nationals have a strong rotation and a so-so pen. If not for his communication problems, some might even consider Williams’s passivity a positive. “I sometimes think that, strategically anyway, managers in general hurt their teams more than they help — meaning that if they would fall asleep in the dugout they might do better than some of the ill-advised maneuvers that they try when wide awake,” NBC Sports national columnist Joe Posnanski wrote last year. Last August, I debuted the “Managerial Meddling Index,” a tool intended to help us take the temperature of every major league manager. Although meddling typically has a negative connotation, it doesn’t have to here: I could’ve just as accurately called this the Tactical Tinkering Index. It’s not a ranking of the worst and best managers; it’s more like a ranking of the least and most managers. While it’s still extremely difficult to calculate how much a manager’s moves have helped or hurt his team, the MMI lets us assess how often he makes them. This year, I’ve brought back the same 10 but also added a couple of categories: defensive shifts and the percentage of opponent plate appearances that came against pitchers who were in or past their third trip through the order. I rejected a number of other options as too roster-dependent (stolen base attempt rate, platoon percentage, relievers used), too rarely called by the bench (pickoff attempts), or too scarce (squeeze plays). Here’s how this works: I calculated the baseline value for each category in each league (since some tactics are more common in one league than the other). Then I compared each manager’s value in each category to his league baseline, yielding a z-score that tells us how far he is from the mean — the number in each box in the table below. The more extreme the z-score, the further the manager is from the mean. Positive values represent categories in which the manager is more aggressive than average; negative values signify the opposite. If you mouse over each row, you’ll see that the boxes are color-coded by value, ranging from red (negative) to green (positive). Add up all the z-scores, and we get a total for each manager that tells us how active he is overall. That’s the “Tot” column, which you can click on in the header to sort. You can also sort by the “Con” column on the right, another new addition this year. “Con” stands for Consistency, a measurement of how stable a manager’s tendencies are across categories. Williams, as one would expect, is the most consistent manager: He’s below the league average almost across the board. On the other end of the spectrum is Rays skipper Kevin Cash, who’s extremely inconsistent, rating well above average in some categories and well below average in others. For my sanity’s sake, I’ve combined the totals for each of the five teams with two active managers, whose percentages of the season are displayed below. The beauty of the Index is its interactivity: If you don’t think a certain category should count (or you just want to see what the list would look like without it), you can click to deselect it and automatically re-rank the managers based on the still-selected categories. If you want to see where a manager ranks in a single category, just deselect the other ones, and they’ll all get grayed out. Cash hasn’t played it safe in his rookie season: He’s the most active manager, with z-scores of at least one standard deviation above or below the mean in nine of 12 categories. His use of pinch hitters (as part of a platoon system) is his most salient trait: Six Rays players have made at least 15 pinch-hit plate appearances this season, led by Brandon Guyer’s 42. As others have noted, Cash has also had a very quick hook with his starters in an effort to minimize their susceptibility to the times-through-the-order penalty. Cash’s starters have averaged only 90.6 pitches per game, a far cry from the outlier on the opposite end, Robin Ventura, who’s left White Sox starters in for 102.5 pitches per game. Cash is also leading the majors in shifts, challenging more often than anyone except Joe Maddon (whose love of the hit-and-run he’s also inherited), and sacrificing less often than any other AL manager aside from Bob Melvin of the anti-bunt A’s. He’s also varied his lineups more than anyone but Buck Showalter, even though Cash predicted more stable lineups this spring. Although Williams has been even more laid-back on the bench than he was last August, when he ranked last in MMI, he’s been surpassed in non-invasiveness by the Royals’ Ned Yost, who manages like a Starfleet official trying to comply with the Prime Directive. Yost is average or below average in every category except percentage of batters faced after the second time through the order, which in his case probably has less to do with minimizing the times-through-the-order effect than it does with leveraging the Royals’ strong bullpen to bail out iffy starters. The notion that Yost plays a throwback brand of small ball isn’t borne out by the numbers: He signals for sacrifices and hit-and-run attempts no more often than the typical AL team, and he almost never issues intentional walks. And while Williams’s lack of action fuels his players’ perception that he’s out of his depth, Yost’s is welcomed as a sign of confidence and faith. 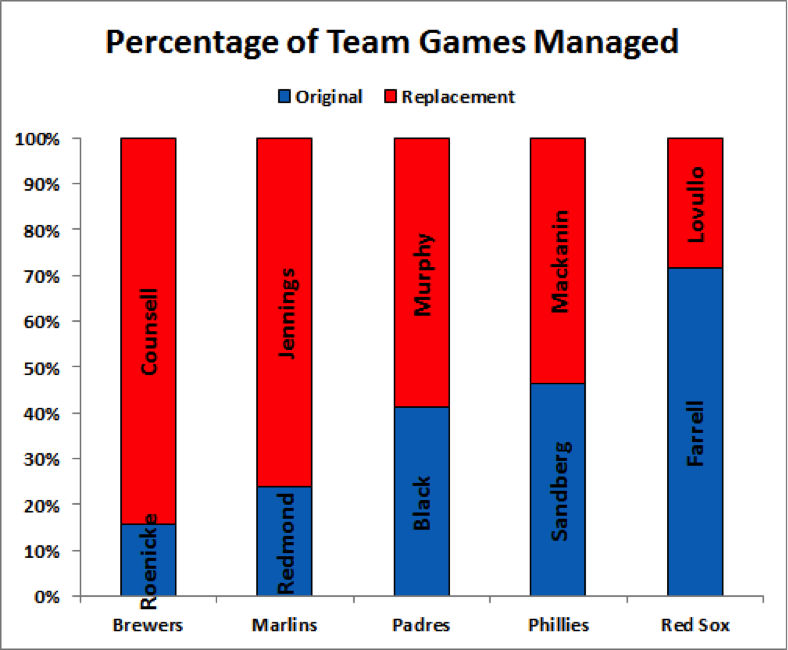 There’s no correlation between team winning percentage and Managerial Meddling Index, which makes sense when you look at the list: The most active manager’s team is tied for last place in the AL East, while the least active manager’s team is tied for the AL’s best record. But a glance at last year’s list reveals a high level of year-to-year consistency, whether because of ingrained managerial habits or roster carryover. Many of 2014’s most aggressive managers — Clint Hurdle, Maddon (who changed teams), Lloyd McClendon, Walt Weiss — are still among the league leaders, and Williams, Yost, and other 2014 trailers are still bringing up the rear. The most notable exception is John Gibbons, who’s been much less aggressive on offense, dialing back his use of bunts, pinch hitters, and defensive subs — for good reason, considering Toronto’s overwhelming offense in 2015. According to the historical data we have, which goes back to 1988, pitchouts are at an all-time league-wide low (for reasons that I’ll explain in an upcoming article). The Red Sox haven’t ordered a pitchout all season, but Reds manager Bryan Price has called for 32, approximating the rate at which teams called pitchouts in the late 1990s. No manager is more out of step with his era in a single category than Price is with pitchouts. All of these categories owe something to roster construction and front-office philosophy: A manager’s use of pinch hitters and runners, defensive subs, and one-out pitchers (like the Giants’ Javier Lopez) depends to some extent on his options, and defensive shifting is often implemented from the top down. And even if a manager is following a philosophy that originated in his GM’s mind, his ability to implement it still tells us something about his receptiveness to outside input and his skill at motivating a team. We’re days away from the playoffs, when we reduce every matchup to a mind game between managers. And if you don’t advance-scout the skippers, you won’t know which insults to tweet. So keep your MMI handy: It makes the mysterious minds of managers a little less opaque. All stats through Wednesday’s games. Thanks to Rob McQuown of Baseball Prospectus for research assistance and to Nick Wheatley-Schaller for assistance with data display.